« Beijing’s Theology of Repression: Is This Anything New? When else to encounter the statue of Virgin Mary, and what better backdrop to all this glitter than the Cross? 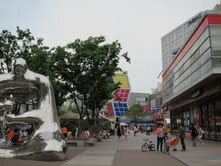 Right next to the crowded shops and restaurants is a small Catholic Church. It was late afternoon and the gate was closing, but we managed to walk in and chatted with a staffer for a while. And as always, we took whatever booklets and other free print materials available as we left. One booklet is a letter written by the Bishop of Shanghai, Jin Luxian, to the Catholic believers in Shanghai, on the occasion of the past Chinese New Year (which fell in February this year). The letter is a rare revelation of the thinking of a Chinese Bishop. 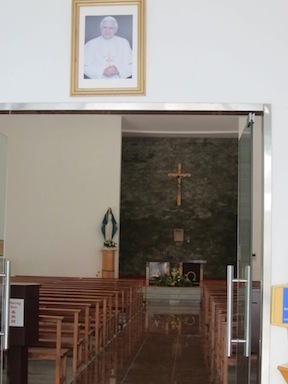 1, The Bishop showed disappointment by the growth of Catholics believers in Shanghai. 2, He opposes over-building churches beyond practical needs. 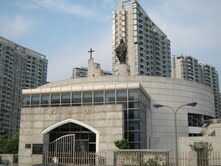 “In 2010, the expenses of building new churches in Shanghai was one third of the diocese’s annual revenue. Isn’t this a huge number? I am not against building new churches, but investment in new churches should match the need for them. Some priests told me that a number of new churches are only open for one or two days a month for masses. They were empty and closed in the rest of the days. 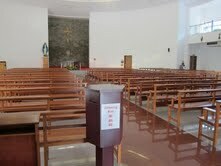 3, He urges priests in Shanghai to reach out to the poor, the underprivileged and the marginalized. Bishop Jin makes a parallel between the direction of Shanghai diocese’s mission to that of the Industrial Revolution. His Excellency Aloysius Jin was born in Shanghai on 20 June 1916；enrolled into the seminary in 1932; entered the Society of Jesus in 1938; ordained as a Jesuit priest on 19 May 1945; since 1951, served as Vice Rector of the Xuhui Reginal Seminary and was the Jesuit Vice Superior in Shanghai as well as China Jesuits Vice Visitor; since 1982, was the rector of Sheshan Seminary; was ordained a Bishop on 27 January 1985; became the Bishop of Shanghai in 1988. Our main aim is to bring together the broken relationships in the families of both Christian catholic faiths. We will pray for your ministry to be a blessing to many. Please pass the website address to your friends. Lord’s prayer is the most powerful prayer ever prayed on this planet earth. World Praying Community is encouraging the body of Christ to use this website as a point of contact, visit it daily and pray the Lord’s prayer and meditate on Psalm 23. This will only take few minutes to do it on the computer. By using this website to pray the Lord’s prayer, you are showing to others who are praying along with you using the website; that they are not alone, you are joining with them in prsyer, this will be a great encouragement to all of us and will lift up the spirit of prayer among us; and will open the doors for the million of people using the internet to turn to God for help. Prayer save life, Lord’s prayer gives direction, it is a prayer prayed according to the will of God, it has great potential in delivering the answers, it motivates us to live a better life. Using the website to pray making this blessing which comes from God to millions of people who are accessing the Internet daily for various reasons all around the world. to all your friends, let us become active participant of this Www Lord’s Prayer movement of World Praying Community. Thank you so much for serving the lord.We shall join you in prayers,and make sure that christianity continue to spread in china. Thank you for your post. I have requoted the bishop in a blog post of my own (in Swedish), referring to this article.